Definition at line 10 of file usbohci.c. Definition at line 13 of file usbohci.c. Definition at line 2578 of file usbohci.c. Definition at line 1708 of file usbohci.c. Definition at line 1227 of file usbohci.c. Referenced by OHCI_BulkOrInterruptTransfer(), and OHCI_ControlTransfer(). Definition at line 1462 of file usbohci.c. Definition at line 2193 of file usbohci.c. Definition at line 517 of file usbohci.c. Definition at line 1276 of file usbohci.c. Definition at line 2313 of file usbohci.c. Definition at line 38 of file usbohci.c. Definition at line 49 of file usbohci.c. Definition at line 2291 of file usbohci.c. Definition at line 81 of file usbohci.c. Referenced by OHCI_BulkOrInterruptTransfer(), OHCI_ControlTransfer(), OHCI_SetEndpointState(), and OHCI_SetEndpointStatus(). Definition at line 2532 of file usbohci.c. Definition at line 2568 of file usbohci.c. Definition at line 2248 of file usbohci.c. Definition at line 1856 of file usbohci.c. Definition at line 2362 of file usbohci.c. Definition at line 994 of file usbohci.c. Referenced by OHCI_CheckController(), and OHCI_InterruptService(). Definition at line 166 of file usbohci.c. Referenced by OHCI_OpenBulkEndpoint(), OHCI_OpenControlEndpoint(), and OHCI_OpenInterruptEndpoint(). Definition at line 228 of file usbohci.c. Definition at line 114 of file usbohci.c. Definition at line 1075 of file usbohci.c. Definition at line 2269 of file usbohci.c. Definition at line 1020 of file usbohci.c. Definition at line 1146 of file usbohci.c. Definition at line 298 of file usbohci.c. Definition at line 268 of file usbohci.c. Definition at line 386 of file usbohci.c. Definition at line 325 of file usbohci.c. Definition at line 376 of file usbohci.c. Definition at line 2547 of file usbohci.c. Definition at line 1960 of file usbohci.c. Definition at line 2334 of file usbohci.c. Definition at line 2164 of file usbohci.c. Definition at line 2155 of file usbohci.c. Definition at line 1699 of file usbohci.c. Definition at line 1628 of file usbohci.c. 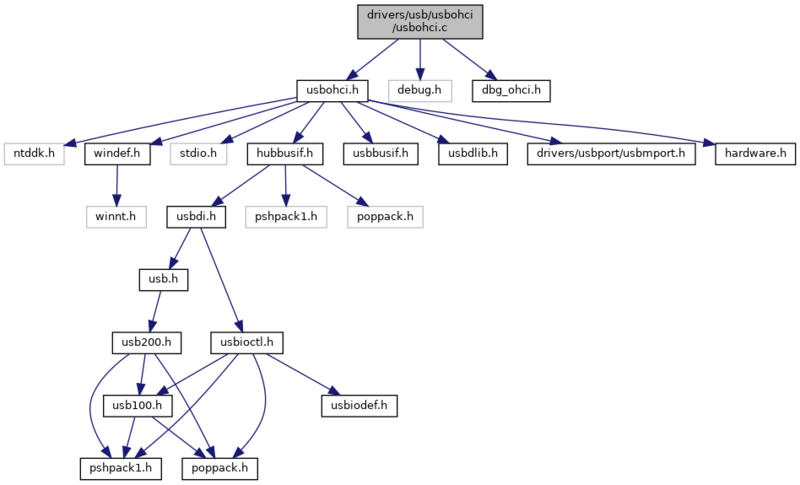 Referenced by OHCI_AbortTransfer(), and OHCI_PollAsyncEndpoint(). Definition at line 467 of file usbohci.c. Definition at line 1248 of file usbohci.c. Definition at line 1877 of file usbohci.c. Definition at line 441 of file usbohci.c. Definition at line 2411 of file usbohci.c. Definition at line 950 of file usbohci.c. Definition at line 2341 of file usbohci.c. Definition at line 1922 of file usbohci.c. Definition at line 2384 of file usbohci.c. Definition at line 630 of file usbohci.c. Definition at line 2517 of file usbohci.c. Definition at line 865 of file usbohci.c. Definition at line 1616 of file usbohci.c. Definition at line 1572 of file usbohci.c. Definition at line 908 of file usbohci.c. Definition at line 529 of file usbohci.c. Definition at line 2558 of file usbohci.c. Definition at line 30 of file usbohci.c. Definition at line 18 of file usbohci.c.